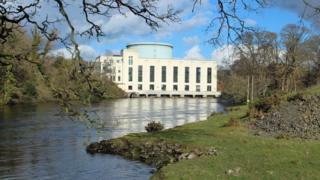 The new owners of a south of Scotland dam could take forward plans for a new hydroelectric scheme. Drax agreed a deal last year with Scottish Power which included buying the Tongland site near Kirkcudbright. Proposals for the hydroelectric scheme first surfaced a few years ago and approval has been conditionally granted by Dumfries and Galloway Council. Drax said the project would see an investment of £1.65m and take about 18 months to construct if it went ahead. "The proposed scheme will make use of the water stored in Tongland reservoir and the existing pipe that delivers the compensation flow to the River Dee," said a spokeswoman. "The powerhouse will be located at the base of the dam. "Water will be transferred from the intake to the powerhouse to drive a water turbine, which in turn, will drive a generator that produces the electricity." She said the operation of the scheme would be dependent on water levels and flow available at the reservoir.